Working in 3 or 4 batches, dip the squash and some of the sage leaves in the batter; let excess batter drip off. 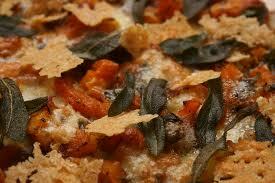 Carefully add the battered squash and sage, and some uncoated sage leaves, to the hot oil. Fry over moderately high heat, turning, until lightly golden and crisp, 3 to 5 minutes. Using tongs, transfer the fried squash and sage to paper towels to drain. Season with salt and serve immediately with lemon wedges.